When people talk about sports car “purity,” we usually roll our eyes and simply embrace the notion that if a car is fun, it’s fun. Period. But the Morgan aficionados who say such things might just have a point. Take a look at the 2005 Morgan Roadster on these pages. Most non-Morgan fans would be hard pressed to tell you if this car was from 1965 or 2005. Sure, up close, we could recognize the airbag-equipped steering wheel and the thoroughly modern, electronically fuel-injected, overhead-cam engine under the hood, but in its most basic form, the Roadster looks–and acts–just like cars the company made some 50 years ago. It even has the same sliding-pillar front suspension first used before World War II. After phasing out the Rover V-8-powered Plus 8 in 2004 as it introduced the slick BMW-powered Aero 8, Morgan announced a new model that was simply called the Roadster, clearly inspired by the Plus 8 and Plus 4 that came before it. Morgan earmarked 82 model year 2005 cars for the U.S. market, equipping the cars with airbags, among other details required by federal regulations. Under the hood, in place of the Rover V-8, Morgan installed a Ford Duratec 3.0-liter V-6 as used in the U.K. Ford Mondeo ST220. Built on a steel ladder frame with a body of aluminum reinforced with wood, the Roadster shows that traditional, small-batch coachbuilding is indeed alive and well in the 21st century. The Roadster may have been built with air conditioning, but it has no proper side windows, just curtains. Its fenders sit well proud of the body, connected front to rear via running boards. Even the round headlamps are affixed between those “wings” and the bonnet. It’s all very old school, but calling it retro would neglect the fact that Morgan never went back to anything. Instead, they have simply maintained tradition and technique. Morgan clearly had this “sports car” thing down for decades, so, even with the advent of the newer BMW-powered Aero 8, it needed an engine to power the classically designed Roadster. Of course, Morgan has had a long history of procuring off-the-shelf engines from other manufacturers, including sourcing them from the likes of Standard, Triumph, Fiat, Rover and Ford. The company had great success selling the Plus 8, powered by Rover’s all-aluminum, pushrod V-8. By the time Morgan produced the last models powered by this legendary powerplant, it displaced 4.6 liters and made a healthy 220 hp and 260-lb.ft. of torque. But Rover made the last of these engines in 2004, ending a remarkable run that started when the company bought the rights to the engine from General Motors in January 1965. When Ford began developing the Mondeo sedan in the late 1980s (to be called the Contour in the U.S.), the intention was to build its first true “world” car that would be virtually the same no matter in which country it was sold, with only small localization efforts to minimize costs. Ford split the engineering up between groups in the U.S., U.K. and Germany. While one group developed the chassis, one the body and another the interior, the V-6 engine program almost became an orphan, its development not budgeted with any Ford engineering center at the time. Until the Blue Oval turned to Porsche for assistance, that is. Porsche has a long history of acting as consulting engineers, so its involvement in the development of the Mondeo’s Duratec V-6 should surprise no one. One version of the story says that Porsche had a project of its own making that it sold outright to Ford. Another source tells us that Ford sought out Porsche’s help when internal conflicts left the project without a home at Ford and Porsche completed the engineering of the DOHC, 24-valve engine with Ford’s longtime partners at Cosworth, who know more than a thing or two about multi-valve cylinder heads themselves. The all-aluminum V-6 started at 2.5 liters, producing 170 hp in U.S. trim in the Contour when it debuted in 1994. The engine became widely used in Ford products, including sedans, small crossovers, Mazdas and even various Jaguars. When Morgan opted for the V-6 as a replacement to the Rover engine in 2005, the 3.0-liter Duratec was rated at 225 hp at 6,200 RPM and 200-lb.ft. of torque at 5,400 RPM. While the torque figure was down quite a bit from the Rover V-8, the lighter, higher-revving Ford engine coupled to a five-speed manual transmission and a limited-slip rear axle proved a robust combination for the 2,070-pound Morgan. Testers reported 0-60 MPH times just over five seconds, a performance level exaggerated by the car’s traditional, open roadster design. Fitted out “the way it should be” meant Rachel having a big say in ordering “the most Morgan-looking Morgan we could find,” according to Ellis. Rachel chose the colors, Connaught Green for the exterior and a slightly darker-than-usual Muirhead Ingleston Saddle Brown for the leather interior. Ellis and Rachel also chose a host of other options to very much personalize their Morgan, including the machined-aluminum “organ-type” accelerator pedal, Lucas driving lamps, machined “bullseye” bonnet knobs, leather bonnet strap, wind deflectors, a host of stainless steel accessories, the carbon composite hardtop and the practically de rigueur badge bar for club and event affiliation. That hardtop can only be used when the entire convertible top has been removed, not just lowered, as there is not a whole lot of storage space in the small Roadster. And that’s okay with Ellis, because he has not removed it in some 22,000 miles over the past 10 years of driving it. Only during the delivery process in 2006 as part of a demonstration at the dealership did he ever bother with lowering and raising the soft top. As for storage space, the luggage rack out back–another option–is a practical requirement, and not just for show if you travel with more than just a toothbrush. Ellis participated in three Carolina Trophy vintage rallies with the Roadster late in the past decade, along with his close friend since childhood, Norris Haynes, who did all of the driving during the timed stages of the week-long, 1,000-mile TSD rally. The twisty mountain roads of the western Carolinas required a lot of arm strength to turn the unassisted Morgan, so Ellis had an electric power steering unit installed, the only modification he has made so far. Getting a chance to drive Ellis’s Roadster, a mix of modern driveline engineering and traditional chassis and suspension, is not one to pass up. With the keys in hand and Ellis in the passenger seat, I gladly climb into the car. But the Morgan, like many exotic cars, takes some effort to climb in and out of, primarily to get underneath the low steering wheel. The biggest trick for Morgan to import this car to the U.S. involved fitting airbags, which required a substantially different steering column. Though there is clearly a tilting mechanism visible on the exposed parts of the column, it doesn’t work and probably just came with the parts that Morgan needed to fit the airbag. But back to the driving position. You get low in the Morgan. Very, very low, though the seats are adjustable. Overall, the car’s 56-inch measured height does not quite tell you how low it feels when you get inside. Much like driving a prewar classic, with its long, narrow hood and separate headlamp buckets, the Morgan gives you more than an eyeful looking down its long, louvered aluminum hood. Given the low seating position, the hood looks higher than it is. The wood dash and black-on-white Smiths gauges complete the classic feel. With the optional hardtop pretty much permanently installed, the view out the back doesn’t offer too much guidance. Apparently, when the folding soft top is installed and lowered, there is even less to see. Good thing the Roadster is fast going forward. The transmission shifts easily, the clutch takeup as uncomplicated as that on a Honda. “It’s the easiest transmission I have ever driven,” agrees Ellis. The three pedals do have a fairly narrow space to share in the driver’s footwell, however. The beauty, of course, is in the driving. Acceleration in this slightly-more-than-one-ton car is more than brisk and the engine likes to rev. I would imagine in a 3,700-pound Jaguar S-type or 3,400-pound Ford Taurus, the engine might feel overwhelmed, the typical driver never interested in bringing it beyond 5,000 RPM into the heart of its power band. But in the Morgan, it revs freely. Though there is no redline marked on the tach, Duratec engines are known to have a rev-limiter over 7,000 RPM, which Ellis admits to hitting from time to time. “But I only ever hit in the low gears–and not when Rachel’s in it, either!” he says. Passing power is bountiful, and we can only imagine how much faster it scoots compared to the original Plus 4 models of the Fifties and Sixties. Road & Track reported a 5.2-second 0-60 time when the Roadster was introduced. Braking feel is nothing special from the front-disc/rear-drum setup, but the binders are effective at scrubbing off speed in our ride, taken on the outer roads of a rather spread-out and not-yet-developed suburban office park, the sort of place where no one bothers you as you tear around a traffic circle on an almost empty road. I think this Morgan is the last true sports car. It has the classic body. It has all the power you need. It drives like a sports car should. It looks like a sports car should. I bought this particular one because I wanted a sports car that would be new and dependable. It has been dependable, and it runs good. This article originally appeared in the August, 2016 issue of Hemmings Sports & Exotic Car. Castor Oil . . . I Love the Smell of This Stuff . . . Can it Be Used in Our Cars? Hi mark! I love the smell of this stuff. I know John Sheally has used it. I see it on eBay sold as pure castor oil. Do you know if it can be used in our cars? [Castor Oil was a basic ingredient in original Castrol Oils. In its raw form Castor Oil is the crap your parents gave you when you were feeling ‘poorly.’ I use a kitty litter like substance impregnated with ‘Castor Oil’ to combat the armadillos that are tearing up my lawn (ok, weeds . . .) It really doesn’t smell all that good. On the other hand, when it was originally used in Castrol Oil, the smell was intoxicating. Castrol is now a major lubricant brand and it has products for just about everything that requires lubrication on a Morgan. Not sure of the chemistry on this new stuff but I am sure it is inline with all the other major brands (e.g. lots of synthetics and semi-synthetics). I doubt the current stuff has that ‘certain’ smell. It is curious that we understand much better than its inventors the way Castrol R works, yet take it for granted. In the case of Sir Charles Cheers Wakefield, later Baron Wakefield of Hythe, the sweet smell of success was more than a metaphor. You still catch the scent of the substance that made his company a household name in the early 1900s wherever older racing engines are exercised: that distinctive, heady perfume of Castrol R. Although castor oil, the origin of the smell, was still the purgative bane of many a childhood when C C Wakefield & Co introduced its Castrol range in 1909 (the name being a contraction of castor oil), to high performance engines on the road and in the air it was to become a more welcome part of the diet. The story begins in 1899 when, having spent 15 years working for the London office of Vacuum Oil Company of Rochester, NY, later to metamorphose into Mobil, Charles Wakefield resigned his position as general manager and determined to strike out on his own. It was an auspicious time to be doing so. Within four years the Wright Brothers would take tentatively to the air, followed albeit somewhat belatedly by compatriot Samuel Franklin Cody at Famborough in 1908. A year later Louis Bleriot flew the English Channel and, five years after that, storm clouds over Europe would spur a period of unprecedented aircraft development effort. On the ground, progress was scarcely less momentous as the horseless carriage progressed from being a curiosity and plaything into an increasingly practical mechanism, as well as another vehicle of human endeavour and national rivalry. Charles Wakefield wasn’t slow to realise that here lay both an important new market for lubricating oils and, just as significantly, a whole new marketing opportunity also. The world was agog at the daredevil exploits unfolding on land and in the air; having your product name attached to such derringdo was a golden opportunity to exploit what today we would call product placement. So Charles Wakefield determined to produce a new breed of oil for this new breed of machine, and make certain that the world knew of it. Engine oil development, like engine development itself, was then in its infancy. Today’s world of multigrade and synthetic oils was a long way off. Prior to the sinking of the first petroleum well in 1859, engineers had had to use animal and vegetable fats and oils for lubrication, but these proved far from ideal at the extremes of temperature involved in the internal combustion engine. As every cook knows, fats and oils thicken when you put them in the fridge and leave gummy, varnish-like deposits when you heat them in a pan. This same behaviour in an engine made cold cranking difficult on startup, while oxidation of the lubricant at combustion temperatures could, literally, gum up the works. Mineral oils relieved these limitations, even in their early forms offering a level of thermal and oxidative stability traditional lubricants couldn’t match. But they were far from perfect In particular they lacked what, at the time, was termed “oiliness”, the ability to adhere to metal surfaces in a thin, continuous film. Wakefield researchers found that whereas castor oil coated a hot metal surface, mineral oil tended to pool on it, leaving areas of metal exposed. Today we have a much better understanding of why this happens. Castor oil is composed almost entirely of triglyceride fatty acids, of which ricinoleic glycerides form by far the largest proportion (typically around 86 per cent). Fatty acids are polarised molecules comprising an oily, hydrophobic (water-hating) head and a hydrophilic (water-loving) tail; the hydrophilic ends of castor oil molecules are adsorbed to the metal surface, leaving the oily heads protruding. The result is that castor oil provides excellent boundary lubrication, much better than that achieved by early mineral alternatives. In hydrodynamic bearings, like crankshaft bearings, where a relatively thick layer of oil is established, this offers no benefits. But where the oil layer is thin — on cylinder walls and cam lobes, for instance — it ensures a higher level of scuff resistance. Mixing castor and mineral oil therefore seemed a good idea in the early 1900s, but the two are not readily miscible. What Wakefield researchers discovered was that a surprisingly small proportion of castor oil — as little as 0.7 per cent — was sufficient to confer its high film strength on the mix, and thus Wakefield Motor Oil (Castrol Brand) was born. In fact, five variants were introduced initially for different applications, Castrol R being the flagship product intended for aero and racing engines. Wakefield & Co’s core business was — and in the immediate future, would remain — lubricants for the railways and industrial customers, but it was Castrol Brand that was to carry the company name to the four corners of the globe. Success was almost immediate. In October 1909, Britain’s first aviation prize, the Inauguration Cup, was won by Frenchman Leon Delagrange using Castrol oil. Following which, on land and in the air, the litany of Castrol successes encompasses many of the most significant events in aviation and motoring history, including Britain’s winning of the Schneider Trophy three times in a row with the R J Mitchell designed, Rolls-Royce powered Supermarine S5, and most of the World Land Speed Records established during the highly competitive inter-war years. In the Great War, Castrol R even came to the attention of Kaiser Wilhelm II, achieving almost ‘secret weapon’ status when it was discovered that a captured British aircraft could operate at considerably higher altitudes than German equivalents due to its engine oil’s superior low temperature performance. In the 1920s castor oil was removed from general motoring oils as mineral oil technology advanced, but its superior film strength ensured it a continued role in high performance engines. Only in 1953 was Castrol R superseded by R20, again containing castor oil but this time mixed with a semi-synthetic, and the successes began all over again. Mercedes-Benz immediately chose it for the advanced W196, Fangio scoring a first-time-out victory for both oil and car when he won the French GP in ’54. Even today castor oil remains the lubricant of choice in certain applications, notably methanolpowered two-strokes because of its complete miscibility with alcohol fuels. As a result you don’t have to go to a historic race meeting to catch that distinctive castor aroma. Appropriately, it can even be smelt where enthusiasts fly model aeroplanes. Morgan Motors have upgraded its PLM !! The MMC is employing the latest computer based design and manufacturing tools as they endeavor to produce the products we so enjoy. (Well, maybe the newer ones . . . ) This news article simply states that they are upgrading to the latest version of their chosen computer design tools. Design Rule, a supplier of Dassault Systèmes Product Lifecycle Management (PLM) technology and services has announced that it had been selected to manage Morgan Motors PLM upgrade to the Dassault Systèmes 3DEXPERIENCE platform from SmarTeam. Back in 1990 Sir John Harvey Jones visited the Morgan Motor Company in the sleepy town of Malvern, Worcestershire, as part of the BBC reality business program Trouble Shooter, where he was surprised to see that the sportscar maker was still making its vehicles in a traditional manner, even continuing to use a large proportion of wood in their construction. Sir John’s advice was simple — modernise, greatly increase production and ramp up your prices. Yet Morgan turned down his advice, the company has gone from strength to the strength. Today, the cars are still handmade in the Morgan factory and the manufacturer has become a global brand, with a long waiting list for its vehicles. Even the late Sir John admitted that he was pleased that his advice was unheeded. In the intervening years, however, the cars have become more complex. Customers expect certain levels of quality and there are regulatory requirements for different geographical markets. Whilst the cars themselves are hand built, behind the scenes, Morgan Motors has invested significantly in modern CAD and PLM technology to support the development of their famous model line-up with long-standing partner Design Rule. Graham Chapman, engineering director at Morgan Motors, said “SmarTeam has served us well over the past seven years, but in order to take advantage of the broader PLM capabilities we saw that it was time to move up to the 3DEXPERIENCE platform from Dassault Systèmes. We have a young design team so we need to provide them with the modern toolset that they need to develop our cars of the future. We also require an environment where we can collaborate with our partners on new and exciting projects”. Chapman also commented “We have been working with Design Rule for approaching eight years. Having delivered our initial SmarTeam implementation they have continued to support us ever since. Their team understands our business in detail and how PLM can best serve it, so we are delighted that we will continue to work together on this business platform upgrade”. “Morgan Motors is typical of many of our customers in that we have a very long working relationship with them,” explained Bob Hillier, Managing Director for Design Rule. 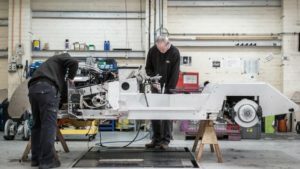 “The project itself is a good example of British industry investing in the latest generation of PLM business solutions to support the development and manufacture of their product, in this case a prestige brand of sports car. We are looking forward to sharing more information about the project as it progresses”. Greetings from West Palm Beach Florida!! Please join our hosts Mary and Bennett Shuldman for a weekend in West Palm Beach, Florida. The weekend will include a special private tour and lunch visit to The Wilson Collection. The collection includes over 100 cars, European. American, with vintages mostly 1950 and 1960’s and 15 vintage road racing cars. All finished cars are licensed and driven on a daily basis and all road racing cars compete in the Vintage series either VDCA, HRS or SCCA. Please make your reservations by September 27, 2017 and send an email to Bennett at: bshuldman@aol.com to confirm your attendance. More details will follow to all those whom register. 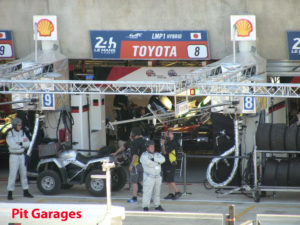 Le Mans is one of the races I’ve always wanted to see . . . 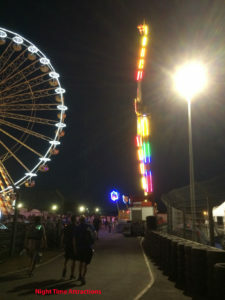 Le Mans is one of the races I’ve always wanted to see, but the logistical challenges involved with getting there from Paris and trying to find a room when most of the 250,000 spectators and thousands of team members book their hotels and even tent spaces years in advance made it seem impossible. But, after attending two European F1 races with Grand Prix Tours and having all those types of problems worked out, I decided to try them this year for the 24 hour race. It was definitely the way to go. I had transportation from and to Paris, one of the finest hotels I’ve ever stayed in, great seats, good company and an excellent tour guide. They even managed to provide unusually good weather. Instead of chilly evenings and mornings and the normal several hours of rain, the weather was sunny with highs over 90 and lows around 80. Needless to say, I was over-dressed. My seat, in a covered grandstand, was at the start/finish line directly across from the beginning of the pits, the official clock and the winners’ podium. From there, I had a good view of the final couple turns, the start/finish line, the pit straight and the first turn. It was a great place to watch some of the racing and marvel at the incredible speed of the LMP1 class Porsche and Toyota hybrids. GT3 cars, like Aston Martins, Porsches and Ford GTs are among the fastest cars in existence, and they were passed on the straight like they were parked. But, there’s only so much of a day-long race that can be watched from one seat. Like many races, if you want the best view of the entire race and want to know just what is happening, you’re better off watching it on TV. At just over 8 1/2 miles per lap you really can’t walk all the way around and sample every corner, but it is possible to get to a couple track-side viewing spots and to see an amazing variety of people, cars and amusements along the way. Plus, the Le Mans museum is a must-see stop. In addition to a lot of vintage cars, it has a huge collection of cars that have raced in the 24 hour, plus a room filled with 1:43 scale models of many of the racers and dioramas depicting various years in the track’s history that have to be seen to be believed. And, while all this is going on, the racing never stops. This is a flat-out sprint race from start to finish. 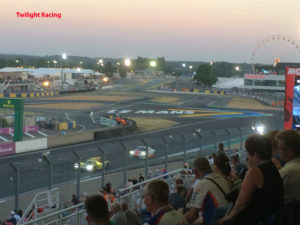 The Porsche hybrid that won overall did not take the lead until about 2 laps from the end. In order to do that, it had to recover from a full hour that it had spent in the garage having a part of its hybrid system replaced. I paid the closest attention to the top GT class since the cars are recognizable. As they approached the finish line to start their last lap, the order was Aston Martin, Corvette, Ford GT and Porsche 911. As they crossed the line 12 seconds later, it was Corvette, Aston Martin, Porsche, Ford. 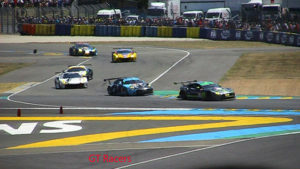 When they got the flag, it was Aston Martin, Ford, Corvette and Porsche thanks to some wheel banging on that last lap. The cheering from all the Brits in the stands demonstrated why this is often called a British race held in France. It took a lot of years to finally make it to the race, and it’s one of those events that I don’t feel a great need to visit again, but it’s one of those races that has to be seen live once just to experience the atmosphere that can’t be captured on film or TV. If I were to go back, I’d probably spend a lot of time trying to find the best vantage points for spectating so that the next time I’d really be able to know what was happening and see more of the actual racing. I guess that’s why most people seem to go just once or every year. If it’s not on your bucket list, it needs to be added. And if you decide to go, check out Grand Prix Tours. Summer is here and when the sun shines a young man’s fancy turns to sports cars. So this (old) man heads to Malvern Link, home of Morgan, and to the driver’s seat of a 4/4, the world’s oldest new car, now in its 81st year of production. Now of course Porsches and Ferraris go faster, Mazda MX-5s are sweeter to drive and Caterhams steer and stop better. 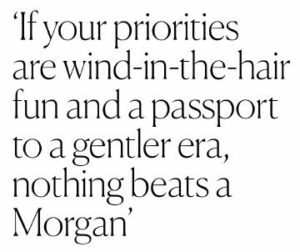 But if your priorities are wind-in-the-hair fun, turn-up-the-volume driving engagement and a passport back to a gentler motoring era, then nothing can beat a Morgan. They are mostly made as they always were: hand-built using mallets and files and saws and human sweat, and crafted from traditional materials. Indeed the frames of the oldest classic models, like the 4/4, are still made from ash. They are far more hand-wrought than any Bentley or Rolls-Royce, whose bodies are invariably made by machine and whose hand-craftsmanship is typically confined to cabin carpentry and trim leathersmithery, plus the odd commissioned bespoke flourish. Little has changed since the 4/4 was new. Morgan is still an independent family-owned company. The manufacturing technique is so unusual and old-fashioned that factory tours (£20) are a popular attraction. Last year, 30,000 people took the tour and, in typical English style, it includes afternoon tea. It gets five stars on Trip Advisor. Our Morgan has a modem 110bhp 1.6-litre Ford engine and a previous-gen Mazda MX-‘5 five-speed gearbox but in every other way it’s about as mechanically similar to a new saloon as a Spitfire is to a 787. Take the windows. There are none. Instead, we find side screens that we unclip and leave behind. It is a beautiful summer’s day, so no need for weather protection. Also, no need to put up the fabric roof, coiled behind our heads. There are only two seats and entry is by a tiny shallow door, opened by a latch. The door has leather pull-straps. It appears to weigh nothing. The steering wheel is wood rimmed and alloy spoked -forget about an airbag – and it’s large and upright, closer to your chest than a modern car’s. The dash is a plank of varnished walnut. The only digital display is total mileage. This is not a digital-age car. Out front there is a little upright chrome-ringed windscreen, and a long bonnet, elegantly sculpted, hand formed and tethered-by leather straps. Little louvres help the engine breathe. We see twin like-frog’s eyes, and elegant sweeping round fenders. The (optional) side-exiting exhaust is just under your right shoulder. It barks into action when you turn the key – you can smell the fumes on start-up – and the engine soon settles into an uneven and throaty idle. Its smallness and all-aluminium body makes for a light car, just under 800kg. There is no power steering, so turning the big wood-rimmed wheel when stationary or at low speed requires shoulder and arm heft. Clutch and brake pedal are also heavy. It feels and sounds fast but isn’t. This is a car that’s all about sensation, not measurement. Just as cycling at 20mph feels faster than driving at 60mph, so the Morgan feels fast beyond the speedo’s numbers. The ride is firm and easily unsettled and the handling lacks finesse. But what do you expect from an 8o-year-old design, whose rear suspension owes more to a wheelbarrow than double wishbones? Like all old cars, it needs manhandling and heft; anticipation and concentration; and, yes, just a little love and understanding. It’s designed for the winding narrow roads of England of 70 or 80 years ago, which still gently crisscross much of the country’s rolling green land. They are wonderful driving roads. Speed is irrelevant. The slower, the better. You’re always interacting with your environment: with the weather, with nature and its many scents and sounds, and with the car itself. It is a different type of motoring, totally alien to the hermetically sealed air-conditioned cabins in which we today rush hither and thither, isolated from everything around us, in a world bulldozed for speed. Every once in a while, it’s good to be transported back to sports cars of yore and to the driving world of yesteryear. Only an old classic, or a new Morgan, can do this. It helps us to understand how much cars have improved and, just as important, how much raw driving enjoyment has been diluted. Of all Britain’s great heritage motoring marques founded a century or more ago, you will not find many where the founding family remains involved. Where are the descendants of Rolls and Royce and Bentley, or Herbert Austin or William Morris or William Lyons of Jaguar or Lionel Martin who took his cars up Aston Hill? In fact, there is just the one: founded 108 years ago and still wholly in the hands of the family, the Morgan Motor Company, whose factory nestles in the lee of the Malvern Hills, is still building retro classic sports cars with frames fashioned from the wood of the ash. That family ownership is looking a little more assured after an extraordinary bust-up with Charles Morgan, grandson of the founder HFS Morgan, was finally settled after more than three years of bitter wrangling. The Morgan board, albeit with none of the family in an executive position, is now hoping for a period of stability so it can begin production of electric versions of its famous bullet-shaped three-wheelers by the end of the year. The 2016 accounts just published by Morgan reveal a business employing 200 people, many of them highly skilled craftsmen, making 800 cars a year with a turnover of £30 million and a profit of £700,000. The plan is that this year will bring in £35 million of revenues and £1.3 million of profit, throwing off cash that can be invested in its electric dream, and to start paying the family again after a dividend drought. Just last month it bought back its historic Malvern factory in a £7.2 million deal, reversing a transaction ten years ago that was used to fund the development of its top of the range all-aluminium Aero 8 cars, which start at £92,000 apiece and sales of which are fueling larger revenues and better margins. As important is the end of the feud that threatened to tear the company — and the family — apart. Charles Morgan was relieved of his executive duties in late 2013 amid a war of words in the press and on social media. The nature of his alleged misdemeanors has never been disclosed. In an outbreak of peace, however, an embarrassing date at the employment tribunal has been averted and Mr Morgan, a 30 per cent shareholder, is back in the fold. “The family is now tightly aligned,” according to Dominic Riley, who was brought in last year as Morgan chairman. That means Morgan will not be going anywhere near the mainstream soon. Production rates may reach 1,000 a year but no more. In 1991 the company was producing 400 a year when Sir John Harvey-Jones’s Troubleshooter programme visited and the Morgan family famously rejected his “change or die” advice. Those orders are increasingly for the Aero 8 range with its top of the range BMW engines. More than half the production remains the classic ash-framed Morgans which use Ford engines and start from £39,000. 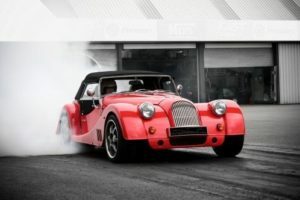 About a fifth of production is the £35,000 Morgan three-wheeler which uses a Harley-Davidson derivative motorcycle engine with a feisty Mazda MX5 powertrain. The company’s ambitions are focused on making electric versions of the Morgan 3 in a project with Frazer-Nash, the engineering consultancy. The promise is that the new Morgan 3 will sound less like Peter Fonda in Easy Rider and more like Anakin Skywalker pod-racing in Star Wars. Mr Morris said the family was keen to avoid the mistakes of other heritage brands that have been on more than nodding acquaintance with the insolvency accountants over the years — marques such as Aston Martin, which has gone bust seven times, and Lotus, which has long been stuck in the slow lane.